I have a mostly glass patio door in my home. It made me feel like I was on display to the neighbors every time I walked past it. And sometimes it let in too much light. So I decided to find some door blinds or curtains or something. The perfect solution for me turned out to be ODL Add-on blinds. I considered hanging curtains, sheers, or blinds from a rod on the door. The problem with curtains was that they’d block all the light all the time. Sheers would be nice, but they would need a rod at the bottom to keep them from blowing around every time someone walked past. 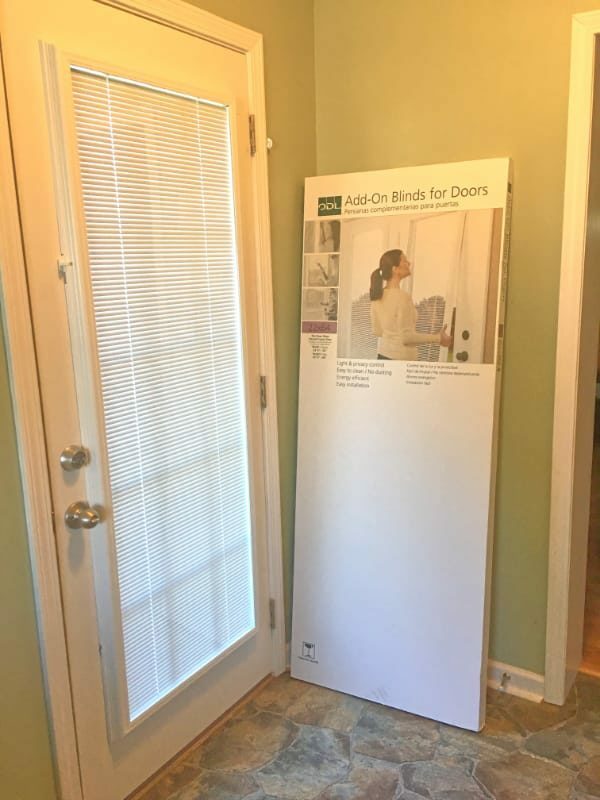 Add-on blinds are pre-assembled units of mini blinds in a frame behind glass. 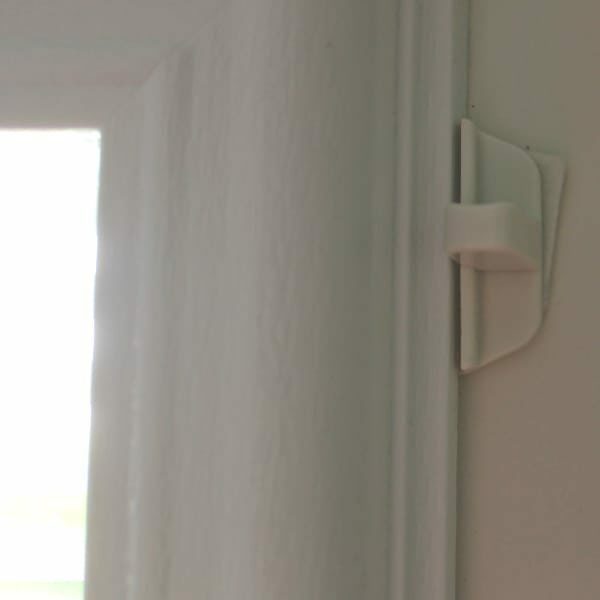 You install them on the door and the blinds are adjustable. You can totally close them or angle them to any degree you like. 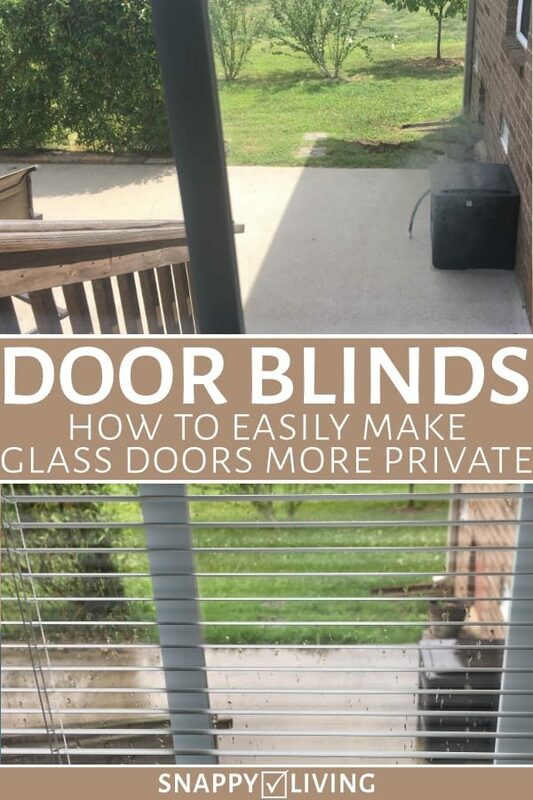 It’s very easy to get as much light as you want and still keep neighbors from being able to see in. And you can easily remove these, should you ever want to do that. These blinds come in quite a few shapes and sizes. If you’ve got any kind of framed door with glass, they probably have exactly what you need. Quick tip: ordering online instead of buying them at the store saves you having to transport them home. Both Amazon and Home Depot will deliver these right to your front door, in whatever size you need. See the word “Remove” on there? It took me a few minutes to see it, so I wish they’d mentioned it in the printed instructions. But once I removed this, everything was working as expected. The whole installation, mistakes and all, took maybe 2 hours. 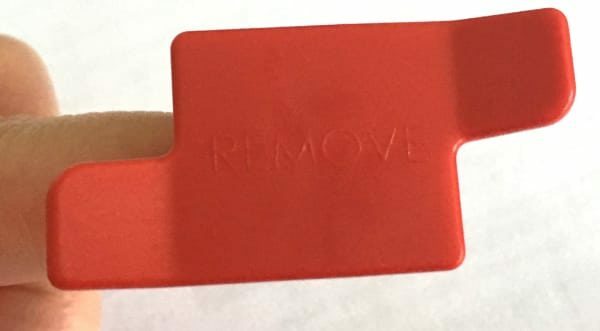 Had I understood about removing the red plastic block, it would have been closer to one hour. It was very easy, even with just one person. This is how my door looked in the end, with the add-on blinds closed. I apologize for the bad lighting – it’s in a narrow hallway, so I had to back deep into a closet to get any pictures at all. Here’s another view of it. And you can also see the size of the box it comes in, and why it’s easier to order it online and have it shipped straight to your home than to haul it home yourself. 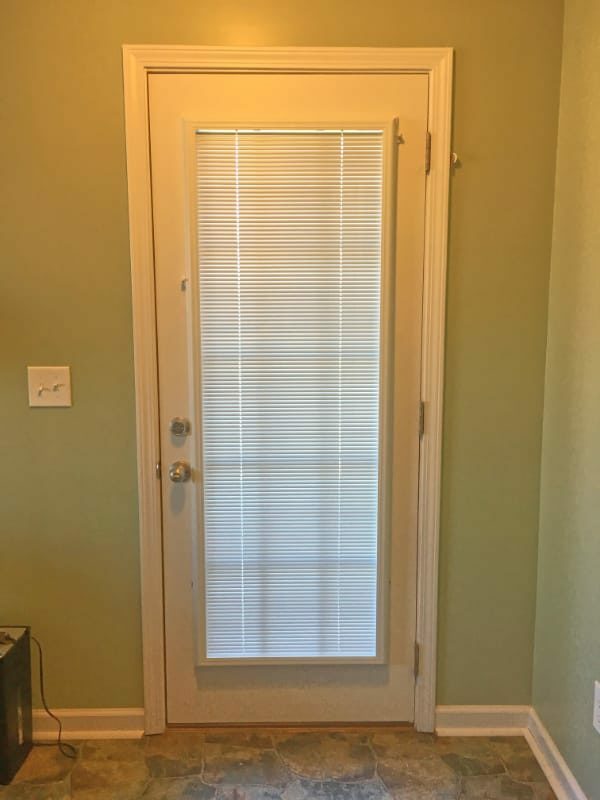 Below is a closeup of the door with blinds open, letting in more light. This position still makes it hard for anyone to see in unless they walk up to the door and peer in. Adjusting the blinds is very easy. There’s a little slider on the side of the frame that turns them to different angles. 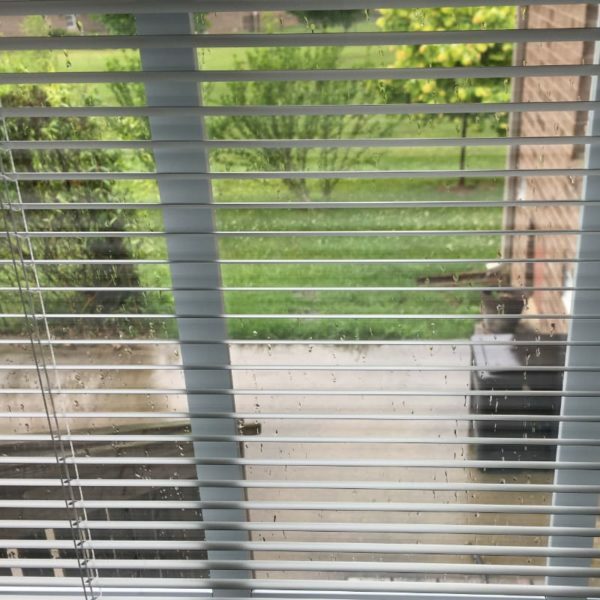 Another slider on the other side lets you pull the blinds completely up and down rather than angle them. 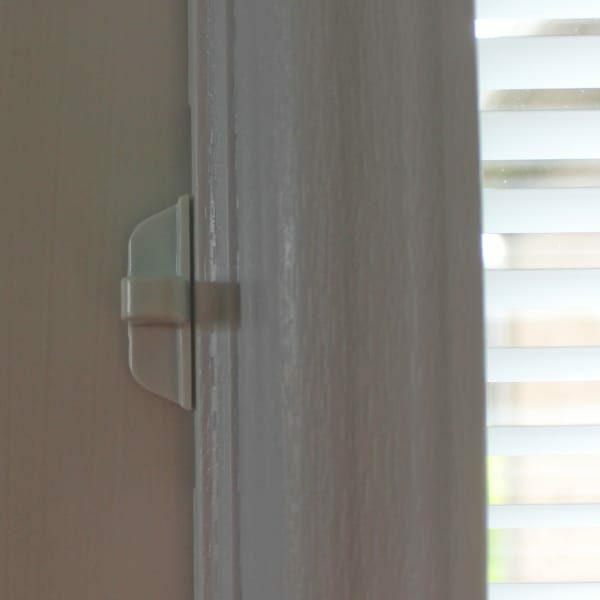 Both sliders move easily and make it very easy to adjust the blinds just how you want. I’m very pleased with how well my add-on blinds work and the functions the unit has. This door that used to bother me is now a nice way to let in light without feeling like I’m on display. I can even watch birds, chipmunks, and rabbits on my patio without them noticing me and scampering away.